Our Range Report on the Black Hills 5.56mm 77gr TMK is now live. At SHOT 2014, Black Hills Ammunition and Sierra teamed up to announce an exciting new round, which we at AR15 Hunter feel may be a good round for mid to large sized game, with the all new .224 77gr Sierra Tipped MatchKing (aka TMK) projectile. Loaded to 5.56mm pressure, the new 77gr TMK promises to offer superior performance over the already popular 77gr Sierra MatchKing (aka SMK), with a ballistic coefficient of .420 (G1)! What this means is that the new TMK projectile will be much more resistant to both drag and wind, meaning it will fly flatter and straighter in adverse conditions. Unlike their SMK projectile, at this time Sierra has not stated that this projectile is not intended for hunting. 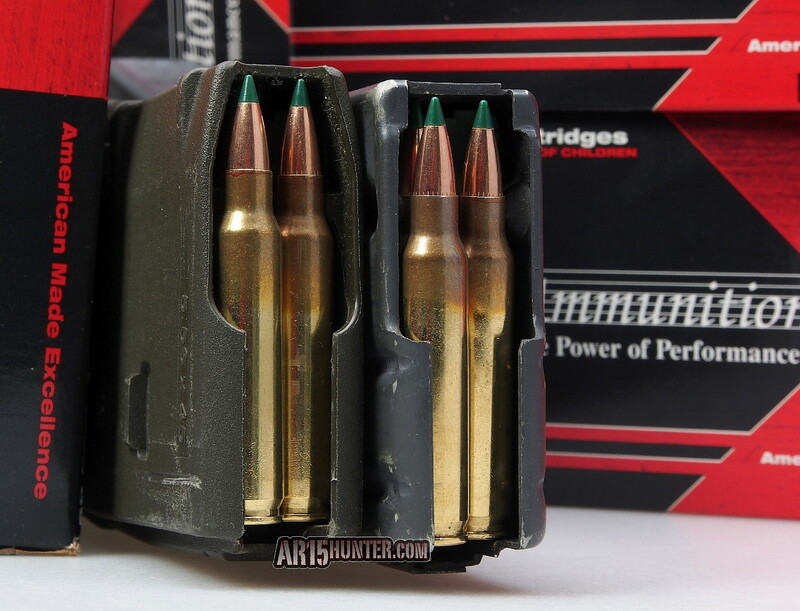 When we first saw this ammo, it looked very similar to their 55gr BlitzKings, which we’ve been very impressed with on the range and in the field. 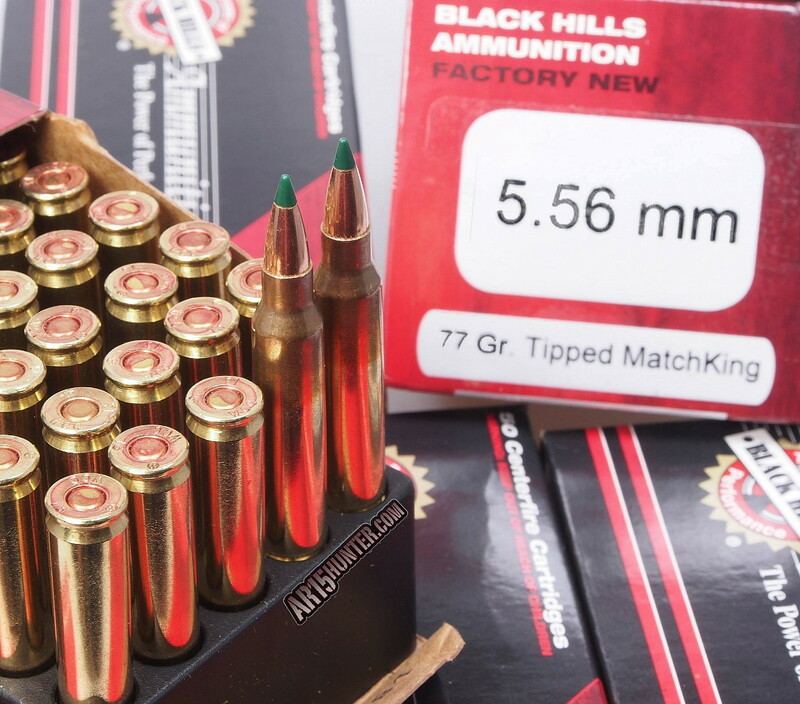 Black Hills’ new 5.56mm 77gr TMK (Tipped MatchKing) rounds. The New Black Hills’ 5.56mm 77gr TMK load is starting to show up at retailers online, with a retail price of about $1/round or more. This is right in line with their 77gr SMK (labeled OTM) offerings (.223 and 5.56mm). We just received a shipment of this ammo from Black Hills to test, so stay tuned for our range report, and hopefully a white tail deer hunt report in the coming weeks. If this new heavier round performs as well as we think it will, it should be excellent for larger game, as well as for longer range varmint hunting. Black Hills’ 77gr TMK (Tipped MatchKing) rounds in a PMAG and GI Magazine. Alongside the 5.56mm load, they also announced the Black Hills’ Gold 175gr .308 TMK load, which should start shipping to retailers in the near future.